1 January 1872: A unit weight fee of 10 kopecks*, an insurance fee, and 5 kopecks for a receipt. The insurance fee was determined as follows: a) for a declared value of 1 ruble up to 100 rubles – 1 %, b) for a value above 100 rubles up to 400 rubles - ½ % plus 50 kopecks, c) for a value above 400 rubles up to 1600 rubles – ¼ % plus 1.5 rubles, d) for a value above 1600 rubles – 1/8 % plus 3.5 rubles. Values expressed in rubles and kopecks are rounded up to the next ruble before the insurance fee is calculated. A full kopeck is collected for any part of a kopeck. 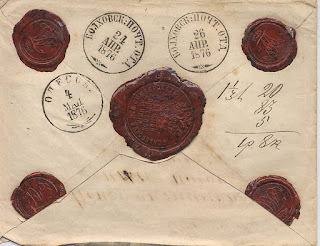 No postage stamps are used on money letters. 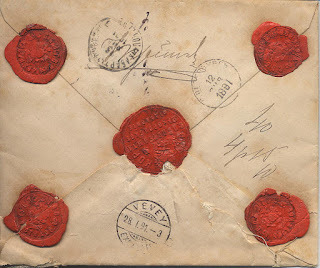 *The weight fee for money letters sent abroad varied by destination. 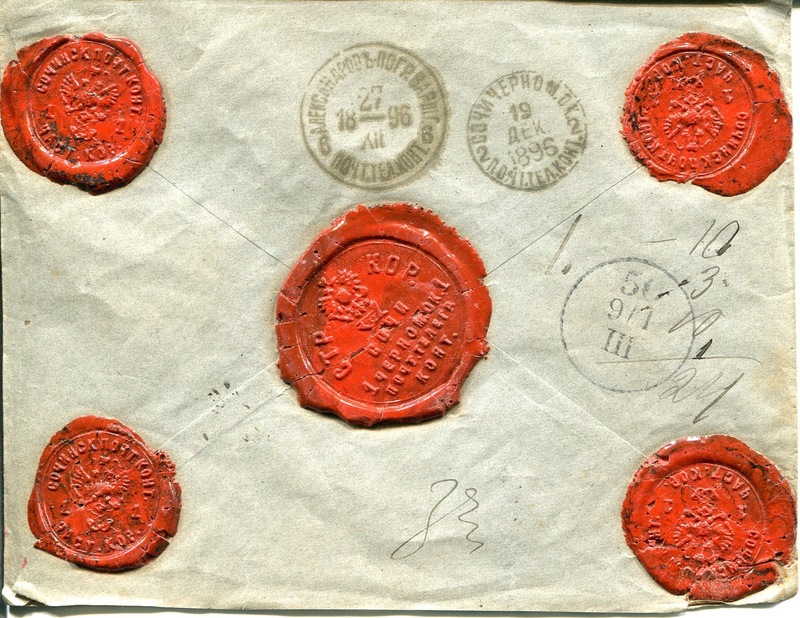 20 March 1879: A new unit weight fee of 7 kopecks for all money letters. New insurance rates as follows: a) for a declared value of 1 ruble up to 600 rubles – ½ %, b) for a value above 600 rubles up to 1600 rubles – ¼ % plus 1.5 rubles, c) for a value above 1600 rubles – 1/8 % plus 3.5 rubles. 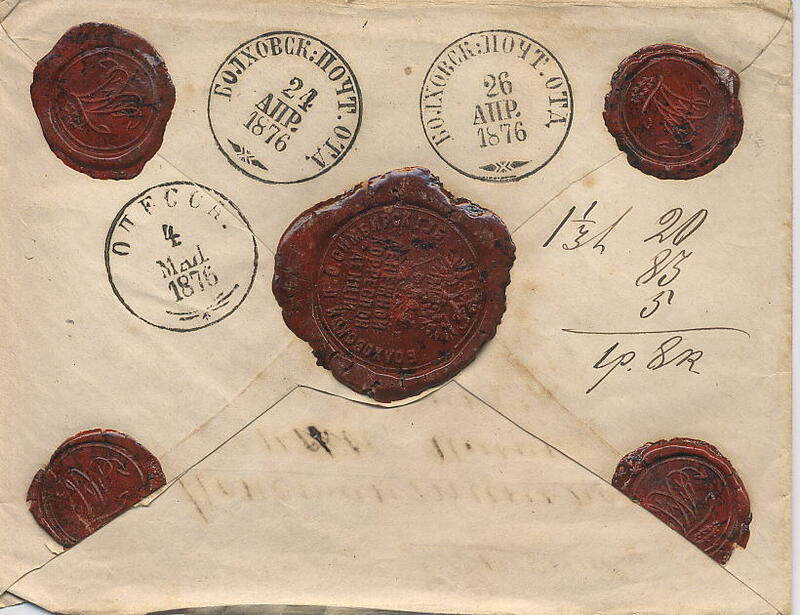 Money letters now had to be registered for a fee of 7 kopecks, but the fee for the receipt was discontinued. 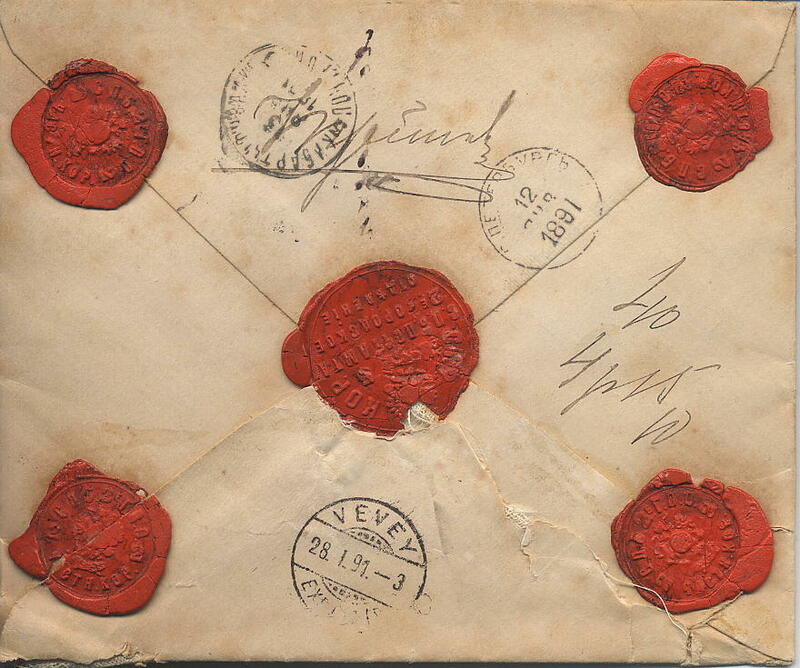 1 April 1889: For international money letters, the unit weight fee and the registration fee were both increased to 10 kopecks. 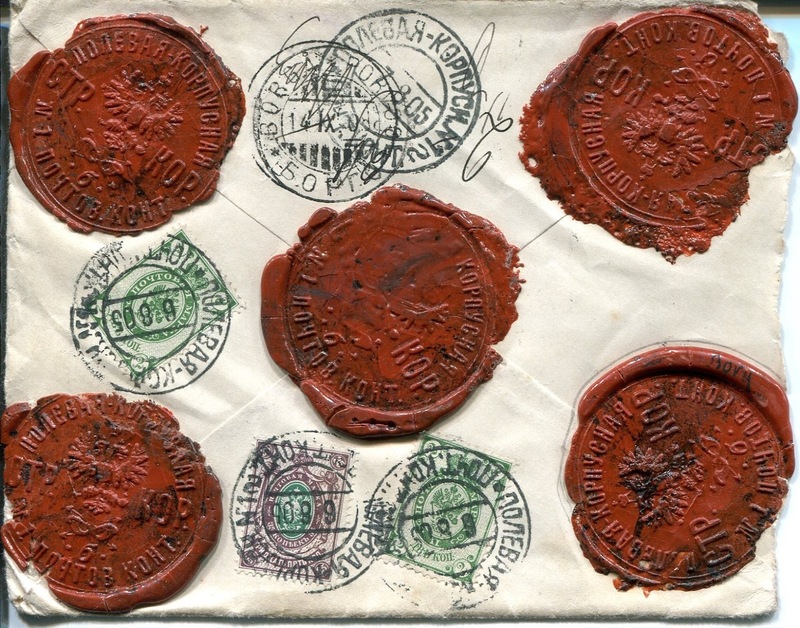 1 June 1893: New international insurance rates: 3 kopecks for each 75 rubles of declared value for countries bordering Russia (Germany, Austria, Rumania, Turkey, Sweden, Norway), and 7 kopecks for all other countries. 20 December 1898: New international insurance rates: for each 112.5 rubles of declared value - 4 kopecks for countries bordering Russia and 10 kopecks for all others, with a 4 kopeck supplement for sea transit. 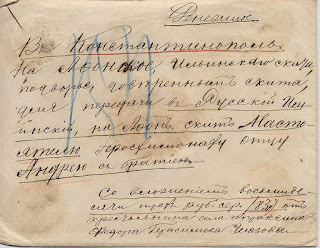 1 January 1903: New domestic insurance rates: a) for declared values up to 600 rubles - ¼ %, b) for a value above 600 rubles up to 1600 rubles, 1/8 % plus 75 kopecks, c) for a value above 1600 rubles - 1/16 % plus 1.75 rubles. 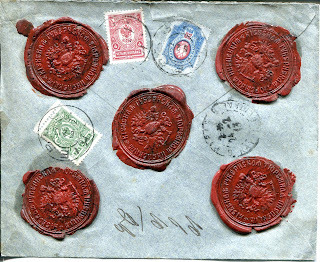 1 July 1904: Henceforth, all money letter fees will be paid for with postage stamps. 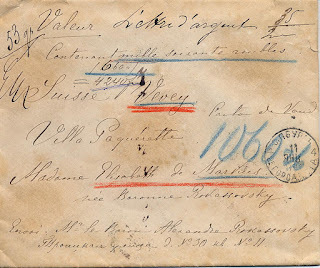 1 August 1904: Instead of clerks writing serial numbers by hand on money letters, a blue-bordered printed label will be affixed, showing the serial number and the post office name. 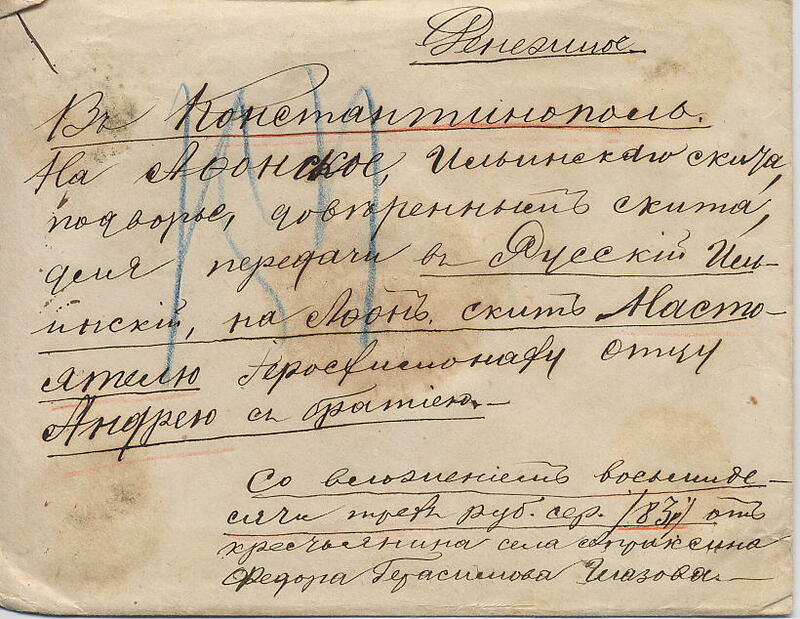 1 January 1905: New domestic insurance rates: 10 kopecks for declared values up to 10 rubles, 25 kopecks for values above 10 rubles and up to 100 rubles. For values above 100 rubles, the rate was 25 kopecks plus 15 kopecks for each additional 100 rubles or part thereof. The fees for registration and sealing wax** were eliminated for domestic money letters. 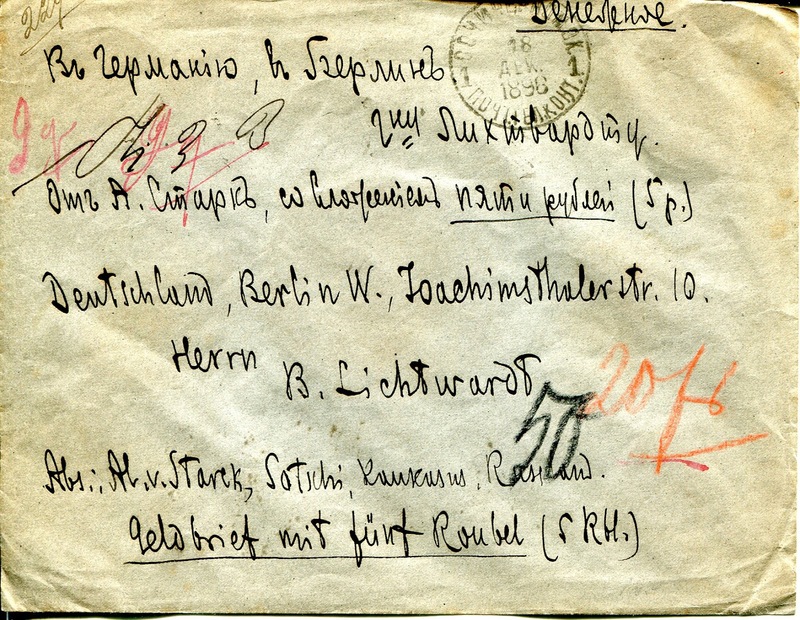 1 May 1909: New international insurance rates which varied on the destination – from 4 kopecks (Germany) to 22 kopecks (Somaliland) for each 112.5 rubles of declared value. 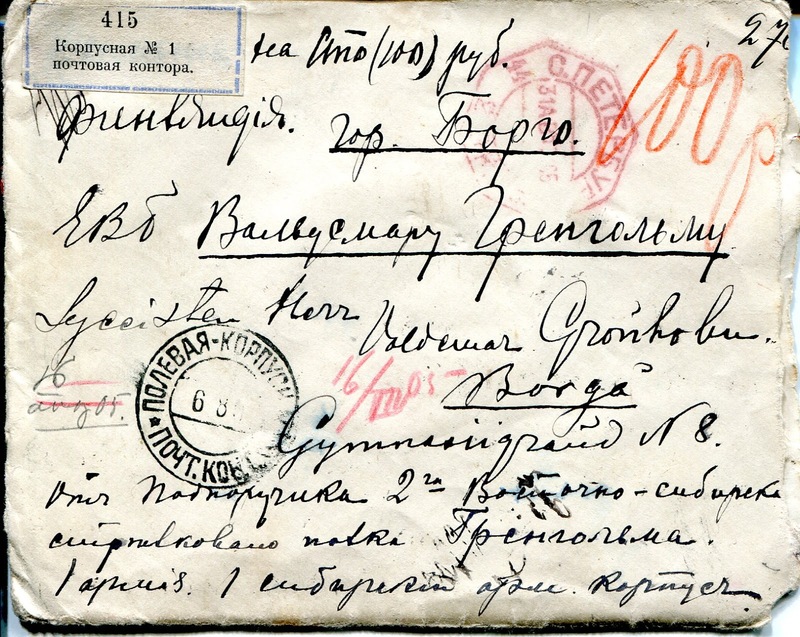 21 September 1914: For domestic money letters, the unit weight fee and the registration fee were both increased to 10 kopecks. 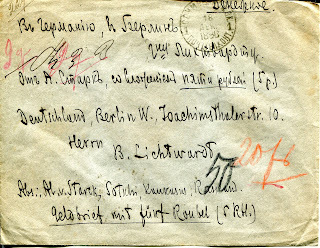 15 August 1917: New domestic insurance rates: 15 kopecks for declared values up to 10 rubles, 30 kopecks for values above 10 rubles and up to 100 rubles. For values above 100 rubles, the rate was 30 kopecks plus 30 kopecks for each additional 100 rubles or part thereof. These insurance rates remained unchanged until 28 February 1918 (new style). 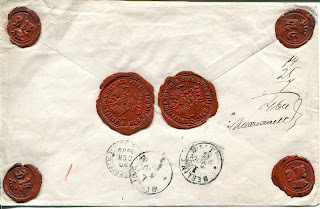 **Each money letter has either official wax seals or those of the sender or some combination of both. The number can vary from two to six or more, but is usually five. The sender could use his own wax or purchase it from the post office. 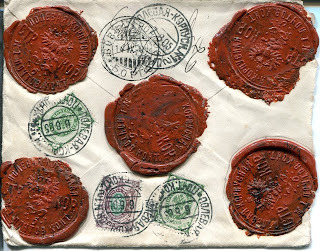 Based on empirical evidence, the cost of wax was one kopeck for five seals before May 1898, and 1 kopeck per seal after March 1901. The price change happened sometime between 1898 and 1901. 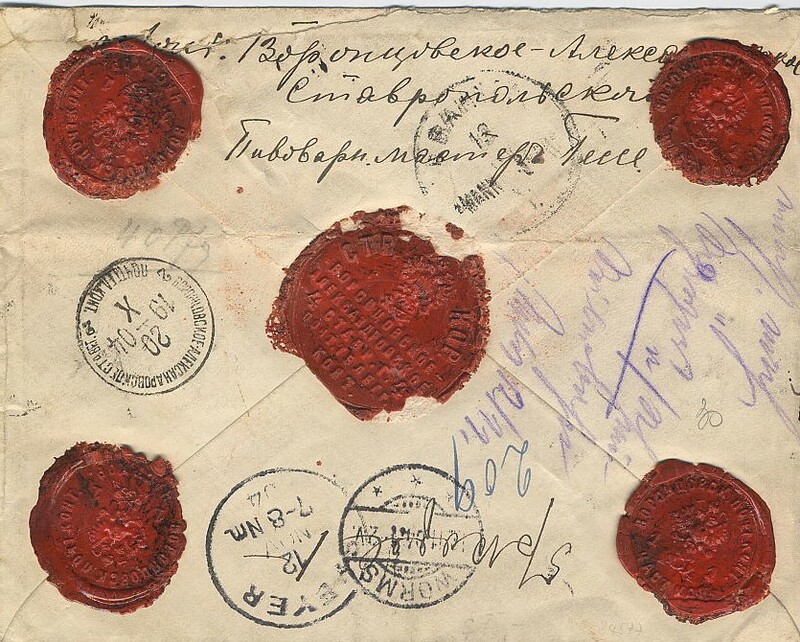 1876 money letter enclosing 83 silver rubles sent from Bolkhovskoye to Constantinople for transmission to a Russian monastery on Mt. Athos in Turkey. The total postage was 1 ruble, 8 kopecks (20 kopecks for double-weight, 83 kopecks for the 1% insurance fee, and 5 kopecks for the receipt). 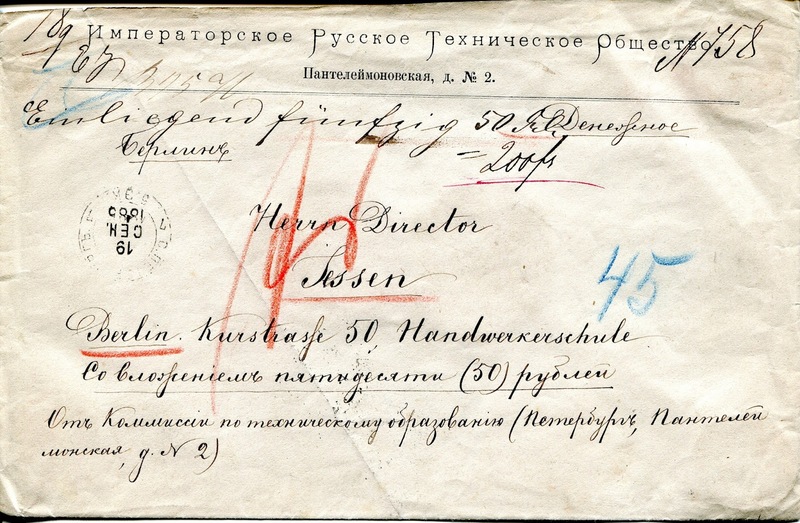 1885 money letter (stationery of the Imperial Russian Technical Society) enclosing 50 rubles (equivalent to 200 francs) sent from St. Petersburg to the director of the Berlin Trade School. 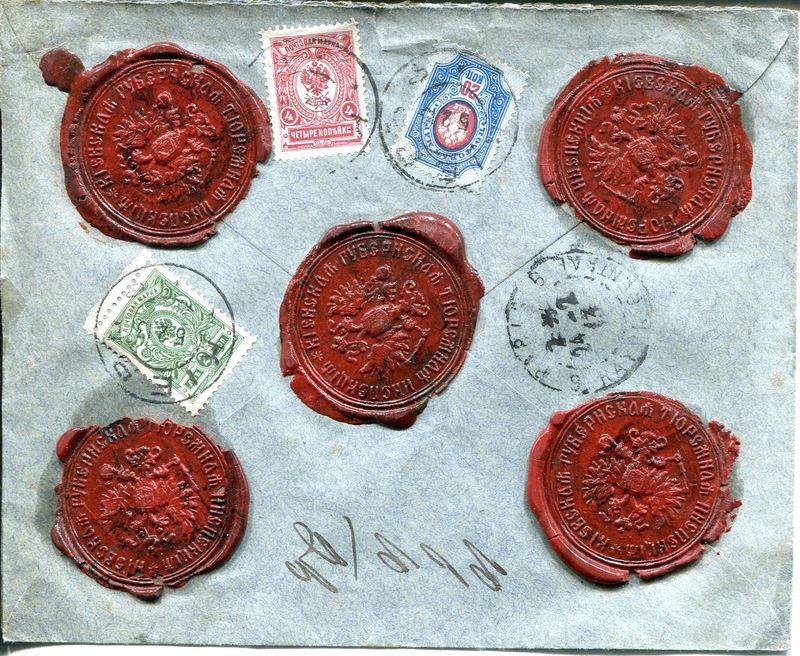 The total postage was 46 kopecks (14 kopecks for double-weight, 25 kopecks for the ½% insurance fee, and 7 kopecks for registration). 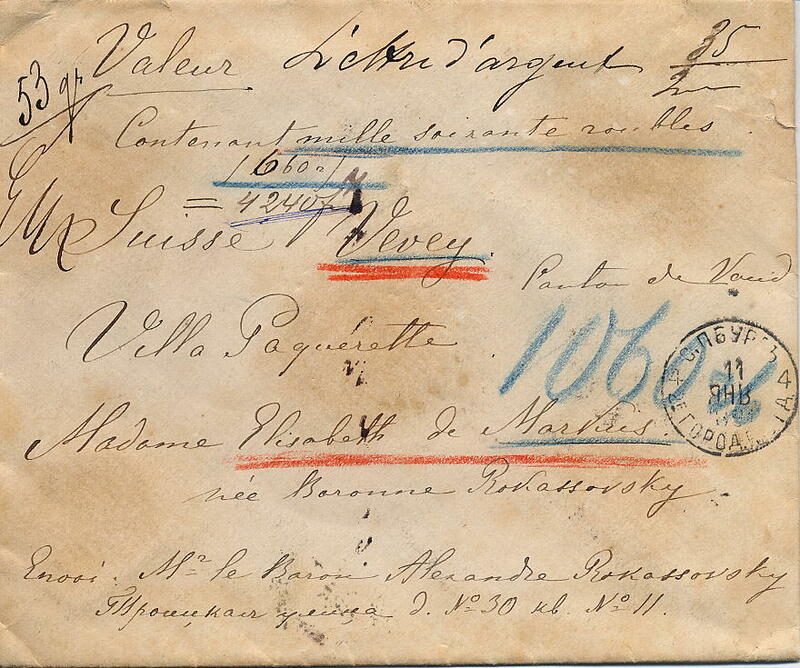 1891 money letter enclosing 1060 rubles (equivalent to 4240 francs) sent from St. Petersburg to Vevey, Switzerland. 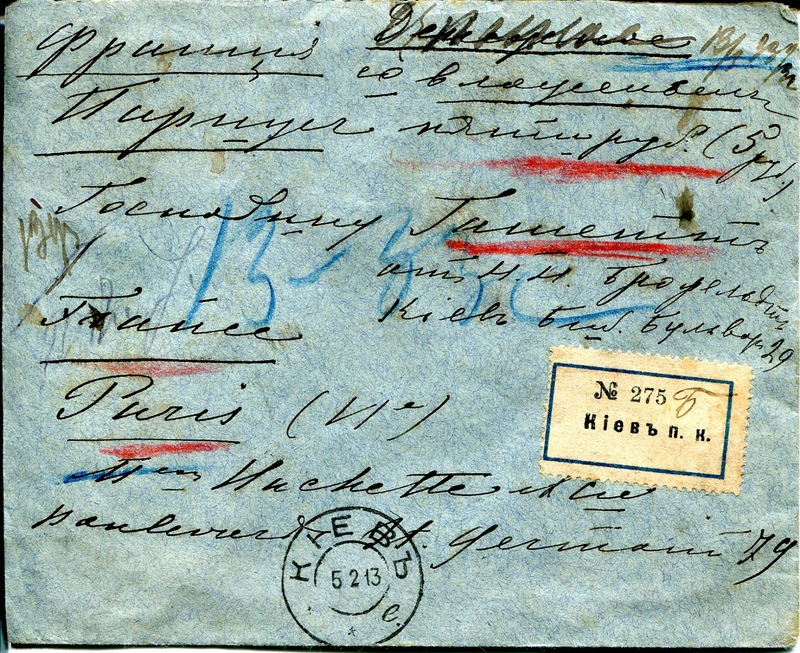 The total postage was 4.65 rubles (40 kopecks for quadruple-weight, 4.15 rubles for the insurance fee [1.5 rubles plus ¼% of the insured value], and 10 kopecks for registration). 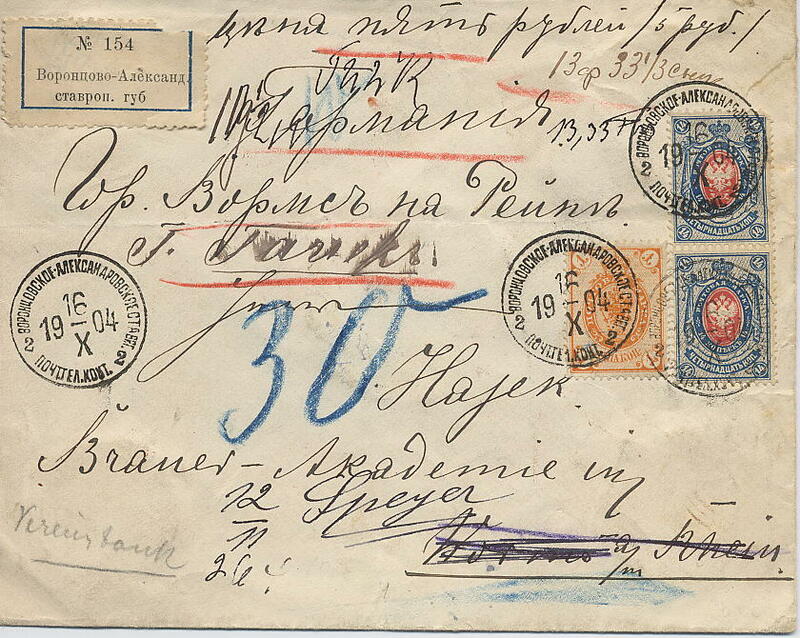 1896 money letter enclosing 5 rubles (equivalent to 20 francs) sent from Sochi to Berlin. Total postage was 24 kopecks (10 kopecks for weight, 3 kopecks for insurance, 10 kopecks for registration, and one kopeck for sealing wax). 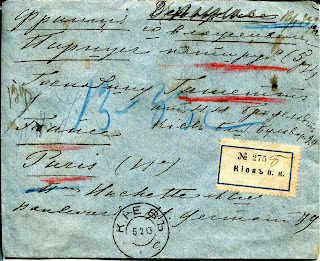 1904 money letter enclosing 5 rubles sent from Vorontsovskoe-Aleksandrovskoe to Worms, Germany, then forwarded to Speyer. The total postage was 29 kopecks (10 kopecks for weight, 4 kopecks for insurance, 10 kopecks for registration, and 5 kopecks for sealing wax). 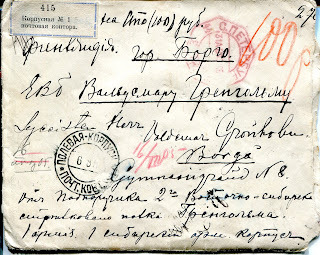 1905 money letter enclosing 100 rubles sent from the fieldpost office of the First Siberian Army Corps in Manchuria to Borga, Finland. Total postage was 39 kopecks (14 kopecks for double-weight and 25 kopecks for insurance). 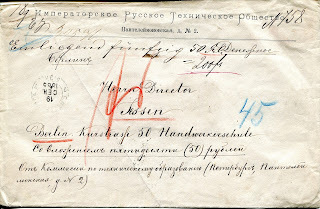 1913 money letter enclosing 5 rubles (equivalent to 131/3 francs) sent by the Kiev provincial prison inspector to the Hachette publishing house in Paris. The total postage was 26 kopecks (10 kopecks for weight, 6 kopecks for insurance, and 10 kopecks for registration). Thank you for this post, it is useful indeed.